The festivals of Kerala are very colorful and are very diverse. It shows the spirit of the celebrations and is an important part of our state. The festivals give glory to the culture and tradition of Kerala. There are different festivals round the year and these make the life of people here vibrant and enjoyable. There are festivals in each season which is celebrated as a reward of nature. The festivals are enjoyed by all the Keralites and are filled with fun and excitement. The people clean and decorate their houses and invite their dear ones to their homes. They also exchange gifts among themselves. They celebrate it with prayers, dance, music which all adds to their joy. Some of the festivals are based on religious beliefs while some are secular. Some of them are related to myths while some are related to man’s behaviors and have a universal nature. Whatever the reason for the festival is, the Malayalis celebrate them all in a colorful manner. They keep aside all their troubles and worries and have a joyful approach towards life. An event which is enjoyed by all the people is the Nehru Trophy Boat Race. The race is held from the Punnamada lake and special pavilions are set up for the audience to watch this race. This boat race was first inaugurated by Pandit Jawaharlal Nehru in 1952; hence it got its name. Separate boat races are conducted for the women participants. In association with the Pratishta function at Haripad Subramanya temple, the Payippad Jalotsavam is conducted. As it is in connection with the temple, it has got religious importance and is celebrated during for three days starting the Onam. The first two days witness the snake boat processions and the competition is held on the final day. This is the only temple festival in the world where large crowd of women gather at the temple to make an offering. It is held at Attukal temple in Thiruvananthapuram. Around several lakhs of women assemble at the temple ground in order to cook a pudding as an offering to the Goddess. It is a daylong festival and it ends in the evening along with a procession. The pudding prepared is taken to their homes once the pooja and offering is done. 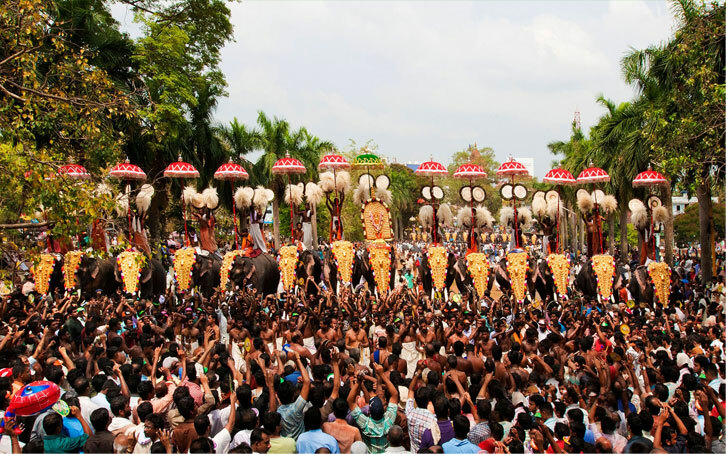 Thrissur Pooram is a festival which is very spectacular with around thirty elephants lined up. The elephants are decked with gold ornaments and each one has three mahouts. The panchavadyam is played which consists of five instruments namely conch, cymbals, trumpet and types of drums. Navarathri festival is observed to worship Goddess Saraswathi. It lasts for 9 days and at evenings classical songs will be sung by various singers. It is held in all the Saraswathi temples. Deepavali is the festival of lights and it is celebrated all over India. People light numerous lamps to beautify their homes and they also burst crackers. Christmas is also celebrated in Kerala just like it is celebrated all over the world. The message of Christmas is eternal peace and is marked to bring peace in the lives of all the people. Singing various hymns and bursting crackers, people pray to welcome the son of God, Jesus Christ.